How Far in Advance Should Party Invitations Be Sent? Invitations are the first step in throwing a birthday party. 3 How Far in Advance Should Party Invitations Be Sent? Birthday parties are generally informal events that don't require the six-to-eight week notice of a formal event. Two to four weeks in advance is appropriate for a child's birthday party or a casual adult party. For a formal birthday event such as a bar mitzvah or quinceañera, however, the formal guideline of sending out invitations six to eight weeks in advance applies. The style of the invitation should fit the party. For character-themed children's parties, an invitation with a matching theme or with a child-centric design is appropriate. Adult invitations can be simple, humorous or fancy; a fancy invitation might be appropriate for a birthday tea, for example, but not for a barbecue. The format of the invitation can be paper, which is best sent by mail, or digital, sent by email or via a social networking site. Digital invitations allow guests to respond online, make it easy to keep track of the guest list and are appropriate for informal parties. 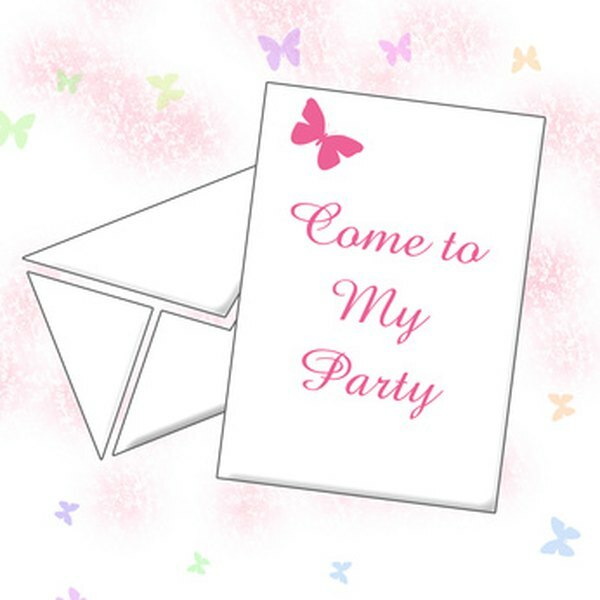 Birthday party invitations should include the full name of the honoree, the date and time of the party, the location and a phone number for responses. The age of the honoree is appropriate on invitations when the honoree is turning 18 or under and for "milestone" birthdays. Verses or anecdotes may be included, but should be brief. RSVP cards are not necessary unless the party is formal; for informal parties, make RSVPs by phone, email or by responding to an e-invite. Hosts may specify "regrets only" on a paper invitation if you want invited guests to respond only if they won't be able to attend. Omit references to gifts from invitations, although it is acceptable to add "No Gifts Please." It is never polite to include a wish list or registry card in a birthday party invitation. Mail paper invitations or give them in person discreetly. For a child's party, do not have the child hand out cards in school or on the bus. If the classroom is the only way you can deliver an invitation to a child, give it to the teacher and have her send it home with the daily paperwork to the parents. Upon receiving an invitation to a birthday party, respond promptly, within a day or two if possible, in the appropriate manner, whether by phone, clicking a response on an e-invite or returning an RSVP card by mail. It's customary to take a gift to a birthday party. Although gift registries are not standard for informal birthday parties, you may ask the host if there is a general wish list or gift registry after you receive the invitation.